As a Riders fan, I don't see the point of this topic. You get used to cheering for "no good" after the first 5 years. It's like being an Oilers fan. That made me throw up a little. Not that I feel like getting in on the Saskatchewan bashing thread, but those ads make it look better than it actually is. Honestly, I think you owe Canuck fans an apology for that. Did you know that if the season ended right now, the Riders would miss the playoffs? Missing the playoffs in the CFL is hard to do, so clearly Saskatchewan is no good. So I hear that the Riders didn't get a win in week 4? Must mean that Saskatchewan is no good. 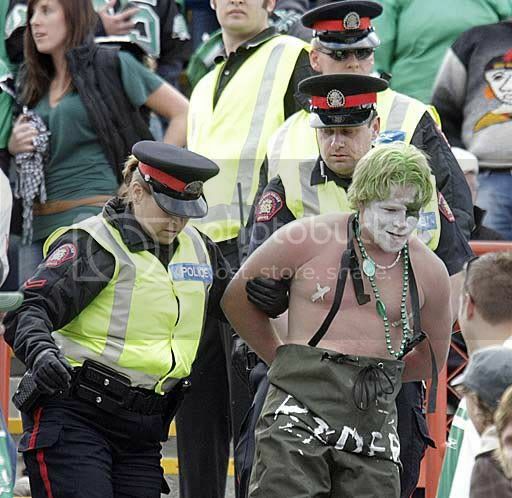 I was once told about rider fans, "Leave them be. It's all they have." by a girl from Saskatchewan. To me that fully explained it. 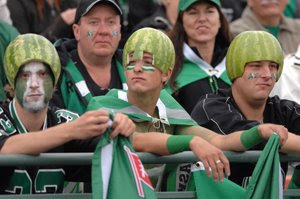 While the Riders currently enjoy a modest 2 game winning streak, solely due to eastern ineptitude, Saskatchewan remains no good because of the slimy & obnoxious fanbase. Simply put, they are North America's answer to English soccer hooligans. Last edited by Howie_16; 08-03-2014 at 01:15 PM. The white away helmets are atrocious. When the CFL is all that you have . . .
Until the Riders start piling up the losses again, I'll go back to targeting the fan base. Why are half the single ladies on POF wearing Riders gear? There is nothing I hate more about living in Sask than having the Riders crammed down my throat. Literally. At Co-op you can go in and buy a 12 pack of Rider-branded water bottles and a gallon jug of green washer fluid with the Roughrider logo smack dab in the middle. F'n hicks will buy anything with that logo on it. Last edited by saskflames69; 08-15-2014 at 12:10 AM. 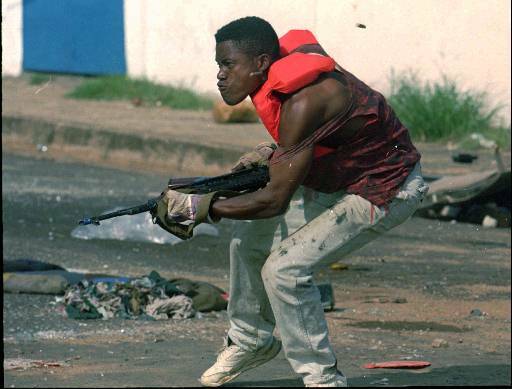 A nearby fan lunges at the officer and his hand appears to grab the policeman’s belt, which would hold his sidearm, pepper spray and Taser, if equipped with one. The officer turns, swings at the fan and they tumble over the seats in the endzone area. Police said only one policeman was called to the scene because the 35 other officers at the stadium were dealing with other incidents. Daroux said in one of the incidents Monday, a spectator was assaulted by another fan so badly his head injuries were at first considered life-threatening. In another, a fan approached an officer with brass knuckles. “I can tell you right now, the games where you’re going to have trouble is when you have Saskatchewan in here, and occasionally Edmonton -- but for the most part it’s Saskatchewan. When it’s Saskatchewan, when you come here, it’s almost like Calgary was visiting here. They’re all in green, a lot of them are drinking and it’s silly,” said Phelps. Last edited by Barbecue; 08-15-2014 at 10:56 AM. Completely agreed. I have been in 1 fight in my adult life and it was with a Rider fan at McMahon who was trying to untie my ex girlfriends top in the stands during the football game. I popped him good in the mouth and pulled him over the seat before security took him out of the building. I think it was in the 2nd quarter and he could barely stand up and form a sentence cause he was already so drunk. What is that supposed to mean? You have it worse because there's an abundance of Rider fans in your city? I don't even like the CFL and I have to deal with its presence on a WAY bigger scale. 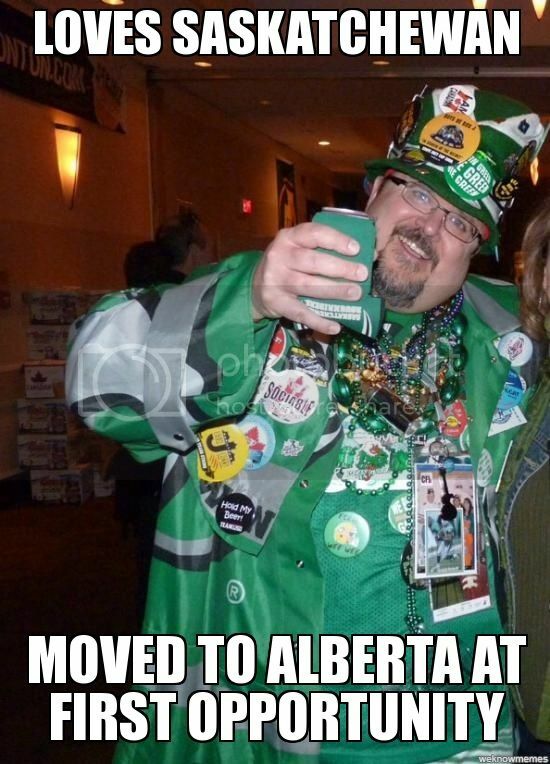 Oiler fans are also a cancer in Saskatoon, but you wouldn't care now would you? You have enough of those at home.